According to Statistics Finland's preliminary data, prices of old dwellings in housing companies fell in the whole country by 0.4 per cent in the first quarter of 2018 from the previous quarter. In Greater Helsinki, prices went up by 0.2 per cent, while in the rest of Finland they went down by 1.0 per cent. Compared with the corresponding period of 2017, prices remained more or less unchanged in the whole country. In Greater Helsinki, prices went up by 2.1 per cent, while in the rest of Finland they went down by 1.9 per cent. In January to March, the average price per square metre of an old dwelling in a housing company was EUR 2,045 in the whole country, EUR 3,593 in Greater Helsinki and EUR 1,584 elsewhere in the country. Prices of new dwellings in blocks of flats and terraced houses fell by 0.7 per cent in the whole country compared with the previous quarter. 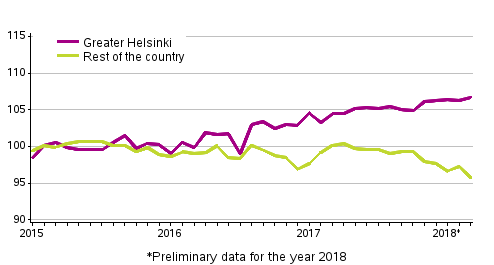 In Greater Helsinki, prices went down by 0.2 per cent and in the rest of the country by 0.9 per cent. Compared with the same period in 2017, prices of new units in housing companies fell by 4.0 per cent in the whole country. Prices went down by 6.7 per cent in Greater Helsinki and by 2.4 per cent in the rest of Finland. The average price per square metre of new units in housing companies was EUR 3,641 in the whole country, EUR 4,691 in Greater Helsinki and EUR 3,270 in the rest of the country. In 2017, good 62,600 transactions of old dwellings in housing companies were completed in the whole country. The number of transactions grew by 2.1 per cent in the whole country from the previous year. In Greater Helsinki, the number of transactions rose by 4.2 per cent and in the rest of the country by 0.5 per cent. Last year, the average price per square metre of old dwellings in housing companies was EUR 2,044 in the whole country, EUR 3,540 in Greater Helsinki and EUR 1,605 elsewhere in the country. From 2016, prices of old dwellings in housing companies rose by 1.6 per cent in the whole country. Prices went up by 3.3 per cent in Greater Helsinki and by 0.1 per cent in the rest of Finland. Last year, the total sum of transactions of old dwellings in housing companies was good EUR 10.0 billion, which was EUR 0.2 billion more than in 2016. Over one-third of the transactions in the whole country were made in the region of Uusimaa and their value was over one-half of the total sum. According to Statistics Finland’s preliminary data, prices of old dwellings in blocks of flats and terraced houses went down by 0.6 per cent in the whole country from February to March. In Greater Helsinki, prices went up by 0.4 per cent, while in the rest of Finland they went down by 1.6 per cent. Compared with March 2017, prices fell by 1.2 per cent in the whole country. In Greater Helsinki, prices went up by 2.2 per cent, while in the rest of Finland they went down by 4.3 per cent. In March 2018, the average price per square metre of an old dwelling in a housing company was EUR 2,035 in the whole country, EUR 3,604 in Greater Helsinki and EUR 1,572 elsewhere in the country. ISSN=2323-8801. March 2018. Helsinki: Statistics Finland [referred: 25.4.2019].